TS KGBV SOs Recruitment 2018, TS KGBV SOs, CRTs, PGCRTs, PETs TS KGBV/ URS SOs, CRTs, PGCRTs, PETs Recruitment 2018 Notification, Online application @ ssa.telangana.gov.in . KGBV Special Officers(SOs), Contract Resource Teachers (CRTs) Recruitment 2018-TSSA KGBV SO,CRT Hall Tickets@ ssa.telangana.gov.in cdse.telangana.gov.in KGBV SO,CRT Hall Tickets Download 2018 KGBV Special Officers(SOs), Contract Resource Teachers (CRTs) Recruitment 2018-TSSA Admit Cards TS KGBVs SOs(Special Officers), Contract Resource Teachers (CRTs) Recruitment 2018-2018: KGBV Special Officers Recruitment Notification 2018 - TSSA KGBV Special Officer Posts Application form. KGBV Recruitment 2018 notification, TS #KGBVs #SOs(Special Officers) Recruitment, TS KGBVs Contract Resource Teachers (#CRTs) Recruitment , Telangana KGBVs SOs, CRTs Recruitment, SOs, Teachers Recruitment in newly formed Telangana KGBVs, Teaching and Non-teaching staff Recruitment in New KGBVs, Urban Residential Schools.The State Project Director, Sarva Shiksha Abhiyan, Telangana, Hyderabad notification has been issued for the recruitment of SOs/Special Officers in Kasthurba Gandhi Balika Vidyalaya Schools of Telangana. Last Date to apply, Procedings, Notification and Vacancies details with Reservation, Application Form, General Guidelines for Special Officers Recruitment Elgibility Criteria, age limit, District wise vacancies, remuneration, roaster points, how to apply details are given here. Telangana DSE and Ex-Officio SPD has given Guidelines for opening of 84 new KGBVs and 29 Urban Residential Schools during 2018-19. In this connection, 84 new KGBVs to be Established in Educationally Backward Mandals and 29 new Urban Residential Schools to be Established for Urban Deprived Children.These KGBVs (TS KGBV English Medium Schools) are to be established in Telangana State for the academic year 2018-19 to provide education to the targeted children in English Medium to achieve the goals of SSA and Education Department and the Urban Residential Schools.DSE Telangana released the 1050 various Teaching and Non Teaching posts recruitment in June 2018 . 15 types of posts to be filled in each KGBVs under this recruitment. 84 new KGBVs to be run in English medium School and 504 CRT Posts to be filled in these KGBV. 1.Application should be submitted through online (http://ssa.telangana.gov.in/). a) The uploaded application along with copies of documents as prescribed must be submitted to the District Educational Officer. b) Candidate should present the following certificates in original for verification when called for. Post Graduate Certificate and B.Ed. Certificate. The State Project Director, SSA, Telangana, Hyderabad has decided to fill up the existing Special Officers(SOs), Contract Resource Teachers (CRTs) in KGBVs on contract basis. 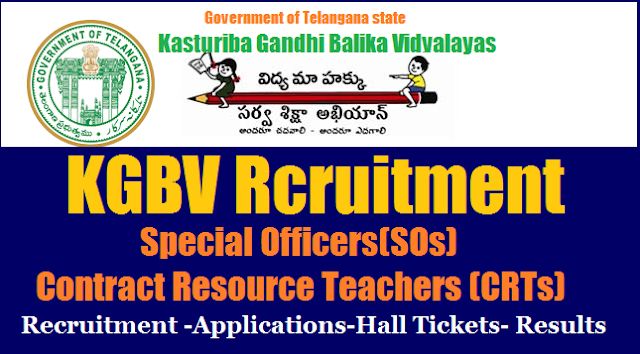 Applications are invited to work asSpecial Officers(SOs), Contract Resource Teachers (CRTs)in the Kasturba Gandhi Balika Vidyalayas located in all Districts (except Hyderabad). which are Residential Schools for girls in classes 6-10, on contractual basis for one year. from eligible female candidates who hold Post Graduate Degree and B.Ed. Teaching Experience is preferred. In Telangana State 398 KGBVs are running with the features of Free Textbooks & Uniforms, Residential Schooling, Individual attention, Continuous Evaluation,Support to the Educationally Backward Children Medical Facility, Vocational Training & guidance and All round development. a.Only female candidates are eligible for KGBVs. b.Existing CRPs & DLMTs are only eligible to apply for URSs. c.The candidate should be a resident of the District where the selection is sought. Candidate should have completed 25 years of age and not have completed 44 years of age as on 01.06.2018. In case of SC/ST/BC candidates the maximum age limit shall be 49 years, 10 years relaxation for Physically Challenged. Special Officers (SOs) of KGBVs/URSs. Name of the Post: Special Officers (SOs) of KGBVs/URSs. Application should be submitted through online (www.cdse.telangana.gov.in). a. Only female candidates are eligible for KGBVs. b. Existing CRPs & DLMTs are only eligible to apply for URSs. c. The candidate should be a resident of the District where the selection is sought. e. Qualifying in TET Exam. Name of the Post: Contract Residential Teachers of KGBVs/URSs Application should be submitted through online (www.cdse.telangana.gov.in). b) Experience of handling administration/financial matters in a responsible capacity. All candidates fulfilling the essential qualifications will be required to appear for a written test.Candidates will be selected purely on the basis of merit in the written test and following the Rule of Reservation. Final selection will be published in the District by the District Project Office concerned. 4. Sarva Shiksha Abhiyan Programme -Objectives, Interventions, Educational and Quality Indicators and Issues, Curriculum, Assessment and Evaluation Procedures. 6. Management, Roles and Responsibilities, Managerial and Leadership Skills, Roles and Responsiblities of teachers and other staff in educational institutions. 7. Child Rights with special focus on girls education. 8. Administrative and Financial Procedures/Rules. 2. The candidate should be a resident of the District where the selection is sought. On selection they should be willing to reside in the same Mandal HQ where the KGBV is located and required to make night halts in the KGBVs. 3. Rule of reservation and the Roster system, will be strictly followed, taking the District as the Unit. 4. The services of candidates will be terminated in case of low performance / indulging in any unacceptable activities / misbehavior / misappropriation of funds etc. 5. The mode of employment shall be on Contract for an initial period of one year from the date of appointment. Performance review will be conducted at the end of the contract period and based on this the contract may be extended. 6. No canvassing is allowed. Any person indulging in such canvassing is liable for rejection of her candidature. 7. The Selection is purely on Temporary basis and will be terminated at any point of time without any notice. Tags: KGBV SO,CRTs, PGCETs, PETs applications, Hall Tickets Download 2018 KGBV Special Officers(SOs), Contract Resource Teachers (CRTs) Recruitment 2018-TSSA @ cdse.telangana.gov.in . KGBV Special Officers(SOs), Contract Resource Teachers (CRTs) Recruitment 2018-TSSA KGBV SO,CRT Application form @ ssa.telangana.gov.in TSSA KGBV S pecial Officer Posts Application form. 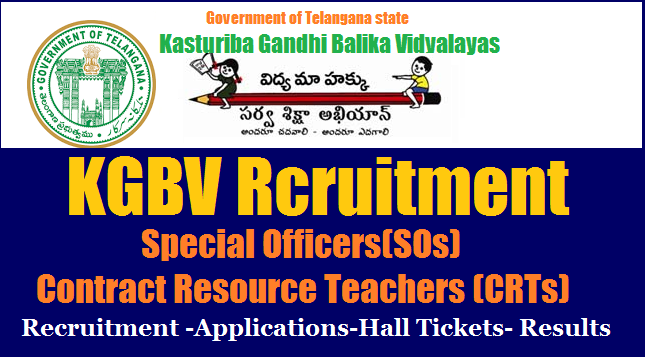 KGBV Special Officers,Contract Resource Teachers (CRTs) Recruitment Notification from SSA Telangana Contract Resource Teachers (CRTs) Recruitment Notification 2018, KGBV Schools of Telangana State , Download Application form for Contract Resource Teachers (CRTs) in Telangana, recruitment of SOs/Special Officers in Kasthurba Gandhi Balika Vidyalaya Schools of Telangana, Last Date to apply, Procedings, Notification and Vacancies details with Reservation, Application Form, General Guidelines for Special Officers(SOs), Contract Resource Teachers (CRTs) Recruitment Elgibility Criteria, age limit, District wise vacancies, remuneration, roaster points, how to apply details available in this page.